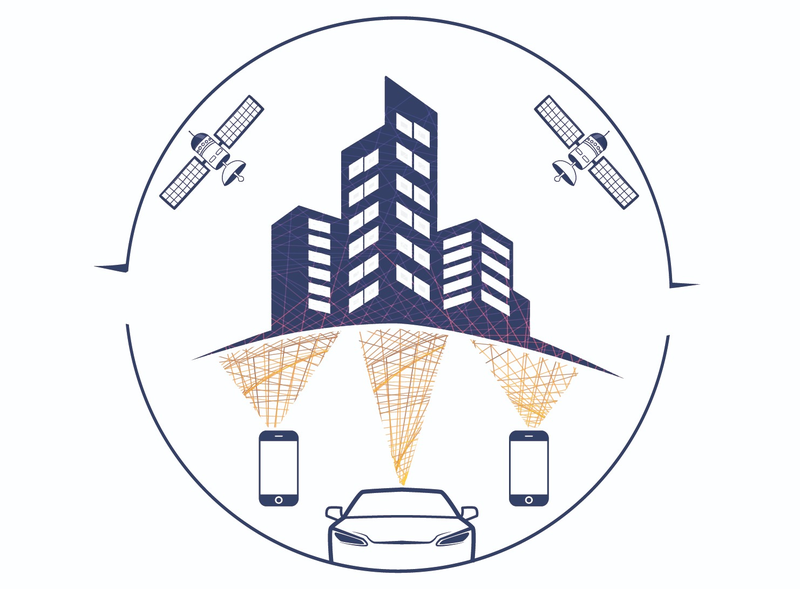 This project applies GNSS signals not only for positioning, but as a passive remote-sensing tool that uses the antennas present in all our cities as hotspots. Using Copernicus mission data, it will be possible to rebuild a city from different angles. Signal data will be obtained from cellular devices and automatically guided machines. Every single user will be guaranteed information at any time of the day and in any area of the world. Thanks to the use of machine learning, deep learning, and neural networks, the project will do nothing less than create a sort of virtual world that can perceive any change in the real world. GNSS satellites are constantly broadcasting radio signals to earth, and part of these signals are reflected back from the earth’s surface. The delay in the reflected GNSS reflected signals on the differential paths between direct and reflected signals will provide topographical information. High-quality GNSS education is a driver of innovation, a means of enhancing companies’ competitiveness, and a valuable opportunity for international cooperation. To bridge the gap from GNSS research and academia to entrepreneurship, the Galileo Masters University Challenge addresses students and research associates with a background in aerospace and GNSS-specific courses of study, in particular with the aim of fostering the transformation of bright ideas into commercial ventures. In addition, the Galileo Masters University Challenge seeks to reach out to any young researchers working in areas of potential applications, be they prospective automotive engineers, logistics providers, game and other mobile application developers, or health promoters. The competition heightens the exposure and credibility of student innovations on a global level while establishing links to the world of business. The evaluators will focus on creativity and market needs rather than the technological perfection of the business ideas submitted. 12 months of virtual incubation, technical and business consultancy support (a EUR 5,000 value) will be provided by the GNSS Research & Applications Centre of Excellence (GRACE). The Institute of Space Technology and Space Applications of the Universität der Bundeswehr München will sponsor a ticket for the Munich Satellite Navigation Summit 2019. The Ecole Nationale de l’Aviation Civile (ENAC) will sponsor a ticket for the first and second place winner to the International Technical Symposium on Navigation and Timing (ITSNT2018) in Toulouse. The first place winner will furthermore get offered a slot of approx. 20 min to present the idea at the ITSNT2018. The winner can access tailored E-GNSS Accelerator business support worth EUR 62,000 (if eligible). The competition heightens the exposure and credibility of student innovations on a global level while establishing links to the world of business. The evaluators will focus on creativity and market needs rather than the technological perfection of the business ideas submitted. GRACE is part of the University of Nottingham's Nottingham Geospatial Institute (NGI), an internationally recognised centre of excellence in surveying, positioning, and navigation technologies. It focuses on helping organisations, businesses, start-ups, and entrepreneurs to take advantage of satellite navigation, positioning, timing, and location-based technologies. We provide business support, consultancy services, training, and testing for the exploitation of new ideas and the creation of new business opportunities. By offering a portal for sharing ideas, engaging with people, and learning about new technologies, GRACE serves as a hub for the GNSS community and beyond. BELS implements a set of coordinated actions to promote EGNSS technologies in South East Asia (SEA), a fast growing market of more than 600 million people. BELS activities span a 3-year period (2015-2018) in which the Galileo constellation is expected to move forward towards the final full configuration. These years will be fundamental to pave the way for the introduction of Galileo services in SEA, both for European companies that can enter a new growing market and for the South East Asian countries that can discover the potentialities of the EGNSS technology. The main objective of the BELS project is to facilitate the breakthrough of EGNSS technology, with a particular focus on South East Asia (SEA), supporting European GNSS companies and conducting activities for awareness raising and capacity building which are cooperatively implemented by different European and Asia-Oceania actors such as universities, research and technology transfer centres, governmental agencies, companies and industries. BELS is funded by the European Union within Horizon 2020, the EU Framework Programme for Research and Innovation, under grant agreement no 636853. The H2020 calls related to Galileo are managed by the European GNSS Agency – GSA.